I saw the above message recently and it resonated with me because, as a high school teacher, I know that a lot of what I’m teaching my students is useless information. That’s not to say they don’t get other, more practical skills from my class, but most of the “knowledge” I will teach them will be lost within a year after my class. This fact doesn’t bother me, because well, people can’t remember everything they learn. What bothers me, instead, is that schools claim their mission is to prepare students to succeed in life once they graduate. 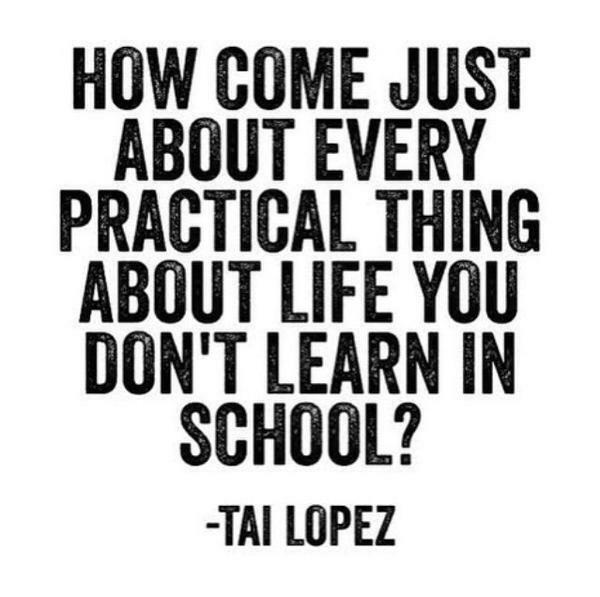 But as a young adult, I feel like I’m constantly teaching myself how to navigate the school of life. So why is it that schools prepare students more for taking useless standardized tests than for the hardest test of all: life itself? I have a great recent example of this from my own life. After a small car accident, my auto insurer hiked my premium substantially. I never learned about insurance when I was in high school, but I knew that after a claim insurance always goes up (even though I paid four years of claim-free insurance to this company). Some people might just accept this reality or even worse, lower their coverage and risk another accident to get a cheaper rate. I did some research online about switching insurers and found out that it’s advantageous to get new insurance quotes every six months because rates can fluctuate so much. Not only this, but there is no penalty for switching from most insurers. So, I shopped around and got quotes, asked my current insurer if they would match it, and when they couldn’t I said “see ya!” and switched for better coverage and lower rates! Another telling example: I started out with my own Roth IRA a few years ago because I knew that I needed to plan for retirement. I didn’t learn this from school, rather I knew it from family and friends. I did research about investing options and have since switched investing strategies. To save money on management and expense fees, I decided to move my Roth to a different investment broker. Now, more of the money I put away actually goes toward my retirement instead of some banker’s pocket. Both of these are the simplified versions of more complex stories. The point is that I never learned about any of this in high school, but these are things that make me more successful as an adult. Not algebraic equations nor historical facts. Not literary novels nor Spanish vocabulary. And there are countless other examples of important adult skills such as: buying a car or house, shopping for groceries, cooking healthy meals, managing bills (SO many bills! ), budgeting finances, interviewing for jobs, paying taxes (the biggest game of them all) and the list goes on and on. Lucky for me, I had adults around who guided me through some of the challenges posed in everyday life. I know this is not the case for many students. That’s why incorporating practical skills into high school education should be the other half of closing the achievement gap and ensuring all students have an equal opportunity to succeed in life. Because in the game of life the only way to be successful is to know the rules and strategies behind winning. So why not teach our students how to play well?